INSEAD received wonderful news last week: for the second year in a row, the Financial Times has ranked our MBA programme #1 in the world. 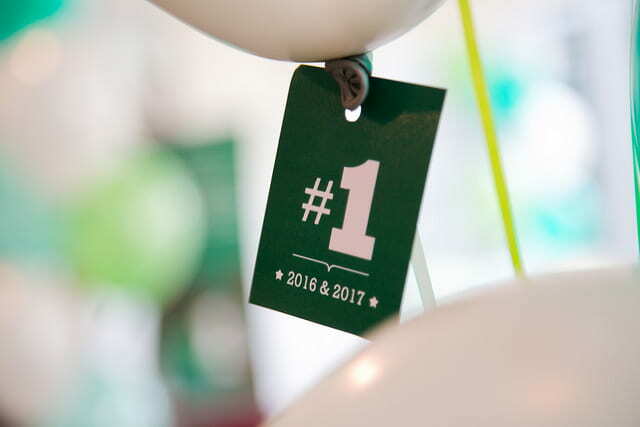 As we celebrate this achievement, it is important not to lose sight of what helped us reach this milestone: Our community-wide commitment to excellence, our belief in our mission and the collective hard work of the INSEAD family. Every day, across every dimension of our school, we strive for excellence in all that we do. At the same time, we remain grounded in our belief that business is a force for good and that we, as a community, have a responsibility to carry that mission forward. Our dedicated faculty push boundaries in research, teaching and thought leadership while our administrators continuously improve our programmes. Our students challenge themselves both academically and personally as they prepare to take on leadership roles around the world. And our alumni build companies, transform organisations and serve as exemplary managers in ways that make us all proud. For the past two years, we have worked to develop a new and enhanced curriculum for our MBA programme. This September, the Class of 2018J will be the first to experience this curriculum, which offers a more personalised learning journey, content innovations, new electives, easier scheduling, personalised career advisors, digital features and a culminating capstone course. In only three decades INSEAD’s PhD programme has risen to become one of the most coveted and successful programmes amongst business schools. The article in this issue gives you an idea of what distinguishes our PhD programme, our aspirations and the milestone anniversary coming up. In January, we welcomed the largest-ever class to INSEAD, with 532 students representing 80 nationalities. Our current class also includes the highest-ever proportion of female students at INSEAD, with women representing 38% of students in the 17D class. We also expect 358 women to graduate this year from our 17J and 17D classes, which is a number surpassed only by Harvard and Wharton. INSEAD continues to work to promote social responsibility. Our school is one of the first to produce a sustainability report that complies with the G4 requirements of the Global Reporting Initiative (GRI). (I invite you to review our most recent report here.) At the same time, our faculty members are finding new ways to approach the topic of sustainability in the classroom. For example, Andre Calmon, assistant professor of technology and operations management, teaches an elective that approaches sustainability through the lens of profitability—with the goal of encouraging wider adoption in the business community. To examine the growing problem of wealth inequality, INSEAD is establishing The James M. and Cathleen D. Stone Centre for the Study of Wealth Inequality. This was made possible through a generous gift from Jim Stone, the founder, chairman and CEO of the Plymouth Rock Group of Companies and a long-time supporter of INSEAD. Professor Mark Stabile will lead the Centre and its research agenda. Many of our graduates demonstrate their commitment to excellence in their own companies. For example, Prabhdeep Singh MBA’16J, Antoine Poirson MBA’16J, and Jose Leon MBA’16 recently founded an ambulance dispatch service company, StanPlus, that significantly reduces wait times for ambulances in India. Meanwhile, Kirk Krappe MBA’88D, the CEO and co-founder of Apttus, is transforming the enterprise software world with his category-defining company. We now have an alumni network of more than 52,000 graduates across 169 countries, and I am so grateful for the relationship that our school continues to have with so many of our alumni. Leonidas Los MBA ’75, the outgoing chair of the INSEAD Alumni Fund (IAF), is one of those alumni. Since graduating from INSEAD more than 40 years ago, Leonidas has been a key volunteer and strong advocate for our school. I extend my deepest thanks to Leonidas for his years of service to the school. I’d also like to welcome Emma Goltz MBA’98 as our incoming chair of the IAF and express our appreciation for her forthcoming leadership. In other news, INSEAD officially reaffirmed its relationship with the INSEAD Alumni Association (IAA), National Alumni Associations (NAAs) and Alumni Clubs in November with the signing of the “INSEAD Alumni Vision 2020.” This partnership agreement renews the commitment of the IAA, NAAs and Alumni Clubs to collaborate with INSEAD in support of the alumni community and school. Finally, as part of the 2017 Salamander Challenge and INSEAD Giving Day, two Salamander mascots acting as INSEAD ambassadors are traveling the world to advocate for our shared belief in diversity, tolerance and understanding. This challenge, the first of its kind at INSEAD, depends on participation from the INSEAD community, and I encourage you to get involved by hosting the mascots and taking part in any NAA/IAF events. The Challenge also reinforces the importance of investing in our school, culminating in the INSEAD Giving Day on 21 February 2017. The Financial Times ranking and the other accomplishments listed above are certainly a cause for celebration as we start the new year. But now our sights are set higher: We are the pioneers that will define management education in the twenty-first century. The INSEAD community must reaffirm that business can be a transformational force for good.